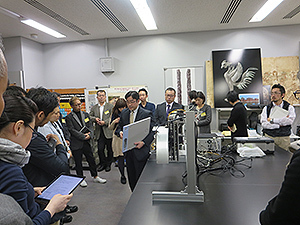 On November 7th, 2016, a party of 20 visited the National Research Institute for Cultural Properties, Tokyo (NRICPT) for the purpose of acquiring accurate knowledge of “cultural assets” and contributing to their exhibition in an environmentally friendly manner at facilities including museums. They attended a lecture in the seminar room, followed by a facility tour to the Library and the Analytical Science Section, where researchers in charge described their business activities. 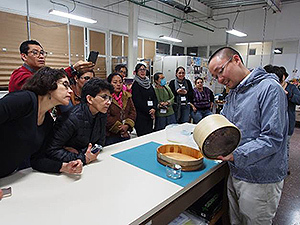 From November 9th through 25th, 2016, the “Paper Conservation in Latin America” was held as a part of the LATAM program (conservation of cultural heritage in LatinAmerica and the Caribbean) run by the International Centre for the Study of the Preservation and Restoration of Cultural Property (ICCROM) at the Coordinacion Nacional de Conservacion del Patrimonio Cultural (CNCPC) in Mexico City, which belongsto Mexico’s Ministry of Culture. 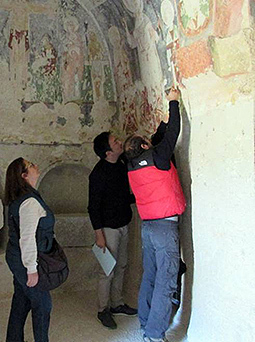 The course drew a total of 11 specialists in restoration of cultural properties from 8 countries, that is, Argentina, Brazil, Colombia, El Salvador, Guatemala, Mexico, Paraguay and Peru. 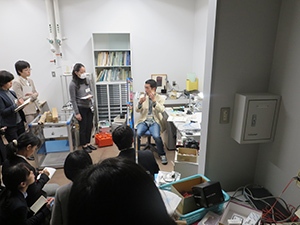 lectures were given on the protection system of cultural properties in Japan, and tools and materials used in restoration. 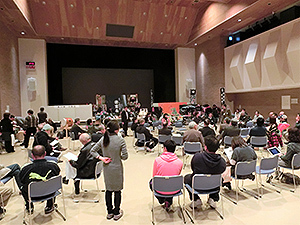 In addition, a practical session was held to deepen participants’ understanding of culture and at the same time characteristics of restoration in Japan. The practical session was carried out with CNCPC staff members who learned “soko” for several months at TNRICP. 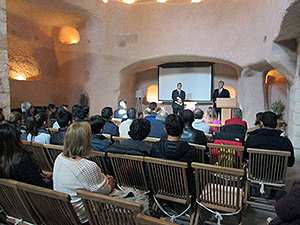 In the latter half of the course (from 18th through 25th), specialists in restoration of cultural properties from Mexico, Spain and Argentina gave lectures. 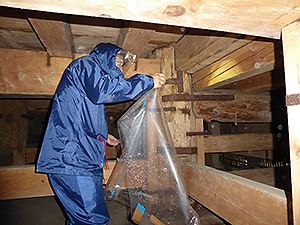 The main theme was application of traditional handmade Japanese paper to Western conservation and restoration techniques. 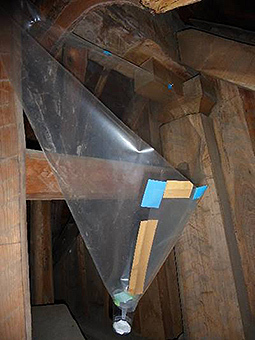 As the conservation and restoration of paper cultural properties in Latin America has not yet reached those in Europe and the United States, they lectured on how to select materials and apply their techniques to Western paper. These lectures were followed by practical sessions. Specialists in charge of the lectures and practical sessions had previously participated in international courses organized by TNRICP, and we were able to reaffirm that technical exchange through these courses contributes to the protection of cultural properties overseas. Under the above-mentioned assistance project, as part of the “Networking Core Centers for International Cooperation in the Conservation of Cultural Heritage Project” commissioned by the Agency for Cultural Affairs, we continue to send a mission to the local site in Nepal. This time (November 20th through December 6th, 2016), we dispatched a total of 16 people, including outside experts and students of the University of Tokyo, Kagawa University, and Tokyo Metropolitan University. The local field survey under this mission covered an extensive range of topics from architectural history to structural study to urban planning, and in this issue, we report on the “Conference on Conservation of Historical Settlements in the Kathmandu Basin” held on November 30th,2016, among others. Many of the historical settlements scattered about the Kathmandu Basin were struck by the Gorkha Earthquake that hit the area in April 2015, and restoration efforts have faced a number of hardships to date. One of them is the fact that the system to preserve historical settlements as cultural heritage is not fully in place and the situation is not necessarily moving in the direction of maintaining and making use of their cultural value. Against this background, Nepalese government authorities, including the Reconstruction Agency and the Department of Archaeology, are working on establishing a system for preserving historical settlements. However, in order to achieve such conservation, while the role to be performed by the local administration that has jurisdiction over them is significant, it has been revealed that owing to shortfalls in budget or personnel, authorities are unable to formulate effective policies. We thus offered overtures to six cities, that is, four cities that hold jurisdiction over the historical settlements in the Kathmandu Basin and are included in the UNESCO World Heritage tentative list and Bhaktapur and Lalitpur, two of which have historical towns that are already registered as World Heritage sites, and organized a conference to share the present state of a wide variety of efforts and initiatives and issues and to provide information on the Japanese system for conserving historical streetscapes. Animated discussions were held on, for example, the necessity of collaboration between the central and local governments and local residents in addressing the issues. Those in charge who participated from each city strongly approved the purpose of this conference and agreed that they would continue to cooperate into the future. We are pleased that this conference helped establish a major foothold for mutually cooperative relations and hope to continue extending effective support. In the Middle Eastern country of Syria, a massive civil uprising calling for democratization occurred in March 2011 and developed into a civil war that has already lasted five years. Casualties in the nation have topped 250 thousand while more than 4.8 million citizens have fled the country as refugees. Because of this state of civil warfare in Syria, valuable cultural assets have suffered damage as well, which has been reported as major news stories internationally. Of particular note is that reports of damage wrought on Palmyra by Islamic State (IS) militants from August 2015 through October last year made headlines and drew public attention also in Japan. 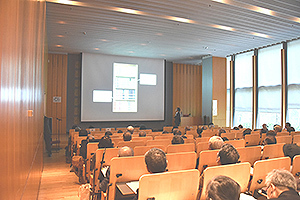 The Tokyo National Research Institute for Cultural Properties (TNRICP) cohosted the symposium titled “The Syrian Civil War and Cultural Heritage – The Actual State of the World Heritage Site at Palmyra and International Support for Its Reconstruction” with the Agency for Cultural Affairs, the Nara National Research Institute for Cultural Properties, and the Cultural Heritage Protection Cooperation Office, Asia-Pacific Cultural Centre for UNESCO at the Tokyo National Museum and Todaiji Temple’s Kinsho Hall on November 20th and 23rd, 2016, respectively. The ruins of Palmyra had been controlled by the IS since May 2015 and they were recaptured by the Syrian government forces in March 2016. Polish and Syrian researchers conducted field surveys at the site in April. 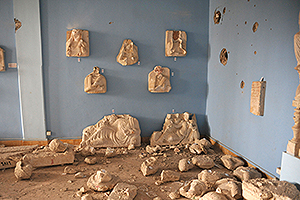 They recorded the state of damage wrought on the ruins in the region and the Palmyra Museum, and provided preliminary aid to damaged artifacts of the museum and transported them to Damascus promptly. At this symposium, Polish and Syrian researchers who witnessed the graphic situation at the site, experts from both home and abroad, and UNESCO staff got together and discussed what type of support would be effective with a view to reconstructing damaged cultural heritages in Syria, including the devastated ruins of Palmyra.